Why and How: Employee Interviews and Surveys - Bellrock Benchmarking Inc.
January 28th, 2013 Tara Landes & Leadership. Annual employee surveys gather critical information about what staff members really think of their jobs. If constructed well, a survey provides great insight into what the company excels at, and what it could do better. But many companies do not formally survey their employees simply because they haven’t figured out how to do it effectively, or don’t get why it matters at all. Most of the time, meaningful answers come from essay-style, open-ended questions, which many companies avoid because they are harder to keep anonymous – although there are still ways to do it. After all, the “employee suggestion box” has been around for decades. The problem isn’t gathering the data anonymously; the challenge is interpreting and acting on the findings. It’s important to remember that your people already give you feedback all the time. 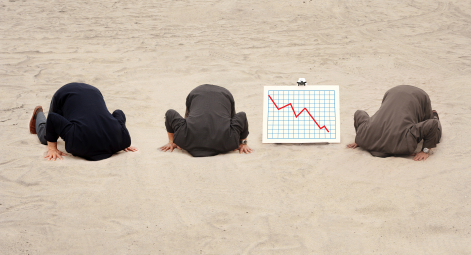 They ask for new equipment or more money; they tell you they didn’t know how to develop that report that a customer just complained about, or that they didn’t know you wanted them to call all the dormant accounts on their list. They’re likely to stop by to tell you about their latest triumph, or what they learned at the conference they attended last week. In our experience, having conducted hundreds of surveys and interviews on behalf of our clients, the information we gather rarely surprises the leadership (though the cloak of anonymity may convince staff to be more straightforward with their commentary). By gathering information from all employees at a fixed point in time, messages about what is working and what needs changing are simply amplified. Why bother, then? Because this amplification allows leadership the crucial space to listen, interpret, plan and act – and the value comes as much from the lens through which the data is interpreted as from the data itself. With methodical and practical analysis, the value of employee surveys outweighs the cost so dramatically, even the tightest of wallets can slide a few bucks out to learn the truth. But it’s only worth it if you act on the information you receive. How do you feel about your daily duties, your pay, and your position relative to your alternative career choices? Do you like your boss, your colleagues, and the people you manage? Does the company provide the requisite tools (technological or otherwise) for you to do your job well? Can you consistently get the information you need to do your job as efficiently and effectively as possible? If you were the leader, what would you do differently? What things would you keep the same? What do you think you are doing really well? Where is there room for improvement in your performance? Constructing good questions and interpreting the results to maximize the value of an employee survey usually requires the help of an unbiased third party. But some companies still try to go it alone, and web services like Survey Monkey and Fluid Surveys allow leaders to gather all sorts of data in a legitimately anonymous way. They also provide banks of best practice questions, and don’t even charge for this valuable information. However, these tools don’t add the unbiased perspective that is often required to prompt real change. 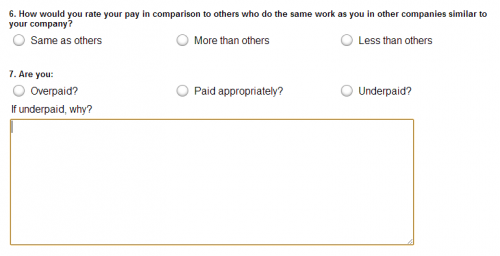 One of the questions we ask in a standard confidential employee survey assesses how people believe they are being compensated relative to the market. Interestingly, if a company is paying a fair, living wage for the work its employees carry out, pay increases usually do not resolve complaints about money. Staff seek something beyond additional compensation but express this desire as a request for more pay (Dan Pink does a nice job of summarizing these desires with his model of Autonomy, Mastery, and Purpose). There is never a more frustrated leader than one who paid big bonuses or large salary increases the year before, only to learn through the next year’s survey results that their employees still feel underpaid. In these cases, it usually isn’t about the money. The fact that people stay despite ongoing compensation complaints means there are other benefits to being at the company – benefits that can be further amplified to address the money issue. If the competitors are paying more, then there is opportunity for efficiency gains that could give employees a measurable way to share and enjoy the benefits of their efforts. The annual survey isn’t the only way to obtain employee feedback; it is just one of the easiest, most efficient places to start. Leaders can simply review the compiled results without a manager having to sit down and interview each of the staff. But managers should be sitting down with their staff routinely, and in a variety of forums, to gather information. Onboarding Interview 1: Expectation Setting. Held on a new recruit’s first day, this meeting reviews the job description, performance evaluation criteria, and sets the overriding principles that will guide the employee’s conduct. Onboarding Interview 2: Reset Button. Held just before the probationary period expires, this meeting allows the employee to evaluate how they are doing in the role and what they require to perform at their best level going forward. The interview is akin to doing a cholesterol test on a 21 year old. It is unlikely that many problems will surface at this early stage, but the answers staff give are a baseline to measure their morale and orientation in the future. Formal Performance Evaluation. This meeting is typically held semi-annually or annually. Ideally, in advance of the meeting, the employee is requested to write an evaluation of their own performance and the company’s performance over a defined period. Routine One-on-Ones. A One-on-One meeting between a manager and subordinate is an opportunity for the manager to discuss priorities and to receive feedback from staff. These meetings should be regularly scheduled, rarely missed, and conducted in person whenever possible. About 1/3 of the agenda should be reserved for the employee to provide open feedback to the manager. Exit Interview: The exit interview is another opportunity to involve an unbiased third party. Best in class companies are almost never surprised when an employee leaves the organization. Between informal chats and formal meetings, managers should be well aware of how their staff are feeling. In most cases, departure is either a last resort for dealing with irreconcilable differences, or part of a mutually developed plan for the staff’s career advancement. Whatever the circumstances, the exit interview is the final opportunity for that employee to effect positive meaningful change on the organization. Leaders who are open to employee feedback set the tone for their organization that staff input is important. Just the act of soliciting feedback once can cause a short term bump in morale and performance. But the leaders who act on that feedback attract better candidates, retain them for longer, run more profitable companies, and have more fun being the boss – all for the relatively small price of a few hours of time each year. Seems like a no-brainer.